Sean Canney (left) and Kevin 'Boxer' Moran (right) are set to swap roles by August. THE MINISTER FOR State at the Office of Public Works and Flood Relief is set to temporarily give up his role between now and August, swapping it with another TD. Speaking today on RTE’s The Week in Politics Independent TD Sean Canney said that he would be trading places with his fellow Independent Kevin ‘Boxer’ Moran ‘sometime between now and August’. Last year, the two newly-elected TDs were crucial in the formation of the minority government. Both wanted the junior ministry at the OPW, with flood relief being a special area of interest for the two men. However, they had to settle on a rotating junior ministry. The men caused some consternation among opposition TDs when they settled on who would become junior minister first by tossing a coin, with Canney securing the win. Addressing the Taoiseach in the Dáil last May, Fianna Fáil leader Micheál Martin said the new government had gotten off “to a very bad start”. “It got off to a very bad start when Minister Canney and Deputy Moran for example tossed a coin as to who would become minister for state,” he said. “I remember asking Deputy Moran in the corridors was it two and a half-years each? To which he replied ‘you must be joking, this thing isn’t going last at all – it’s one year at a time’. It appears now that the changeover may take longer than a year, but Canney has confirmed that it will take place before August. Speaking today, he said the changeover would be “a seamless transition”. “I think this will be a seamless transition in that Deputy Boxer Moran – who has a huge amount of knowledge in the area of flooding – has been a great source back up for me,” said Canney. 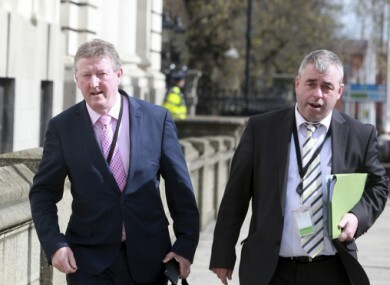 The two men are said to have become close allies since the Dáil term began, constantly working alongside each other. “Whatever we look like or whatever people say we’re like the one thing is how are we performing,” said Canney. Also speaking on The Week in Politics, Fianna Fáil TD Michael McGrath complemented Canney on his performance as minister, but reiterated the party line that tossing a coin was no way to assign a ministry. “Minister Canney has taken on the role with some vigour and he has been accompanied on many occasions by Boxer Moran, so we wish them well,” said McGrath. Independents 4 Change TD Joan Collins expressed no objection to the swapping of the ministry. “I believe that jobs can be done well if there’s an intent there to do it well,” she said. Email “Minister who got job after coin toss to swap role with close ally by August”. Feedback on “Minister who got job after coin toss to swap role with close ally by August”.